As well as hundreds of homes on the huge Whitehouse Farm site, permission has been granted for Linden Homes and Miller Homes to build a new primary school, a country park, sports pitches and a centre for employment, retail, health and community use. Permanent access will be built off Broyle Road with a temporary road installed off Clay Lane for construction traffic. The greenfield site is by far the biggest of four Strategic Land Developments in Chichester District Council’s (CDC) local plan, earmarked for 1,600 homes – the largest single development in the city’s history. Phase one will see 750 homes built with 30 per cent affordable or affordable rental. After a huge planning process which saw scores of objections, CDC’s planning committee gave an indication of approval in November 2016, subject to legal agreements known as Section 106 being signed, expected to happen by April 2017. A year later than expected the complicated legal documents were officially signed on April 11, 2018, granting outline planning permission to Linden and Miller Homes for the first 750 homes, meaning building can now start. Much of the contention during the planning stage centred around the developers including a southern access road to link the homes to the A27, so not all the traffic would filter through the adjacent Parklands estate. The developers are believed to still be locked in discussions with Bishop Luffa School over the replacement of its playing fields to make up for the loss of land to the southern road. Part of Centurion Way cycle and walking path will also be re-routed. The planning process for the remaining 850 homes has not yet begun. The final sign-off for the homes will be welcomed by Chichester District Council, which is under pressure from the government to deliver the homes it agreed to in its current local plan, while currently having to look for new housing land for its local plan review. Of the four strategic land sites, only Shopwhyke Lakes currently has houses being built, with Tangmere stalling and CDC considering using compulsory purchase powers. 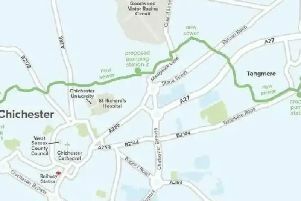 The developers paying £50,000 for cycle improvements for Parklands, including a new route from Brandy Hole Lane through Bristol Gardens, Worcester Road, Little Breach, Norwich Road and Parklands Road. £28,000 for cycle improvements along St Paul’s Road. 3.95 hectares of sports fields, including a rugby, football and cricket pitch. A traffic calming scheme on Sherborne Road and traffic management Westgate.